Looking at the landscape to be explored in the New Year. Mastcam Left image of the "Rock Hall" drill hole, red Jura slab surrounded by sand-filled polygonal troughs. We are still very excited and happy that the final drill hole, "Rock Hall," on Vera Rubin Ridge was successful over the weekend. Now we get to analyze the drilled sample with rover instruments. Sol 2263: We have sample! At the end of last week, the team made the call to drill the rock "Rock Hall," and Curiosity had no problems drilling the target. Sols 2260-2262: Go for Drill on the red Jura! In our last plan, we carried out triage activities on the red Jura target, "Rock Hall," including APXS of the target to determine composition, and engineering tests to assess the stability of the rock and its hardness, both of which would affect our ability to drill. Sols 2258-2259: Is THIS the red Jura we are looking for? The drive around to the north side of "Rock Hall" in yesterday's plan was successful, placing us at a lower tilt and with room in the workspace to place all the piles of sample we drop on the surface (purposely!) in the aftermath of drilling. Even on Mars, where every second of Curiosity's sol is planned, things don't always go quite as expected. After a successful weekend of activities and driving, we were hopeful that we would wake up on Sol 2256 and be ready for contact science and drilling. This Navcam image shows the outcrop of red Jura rock that the rover will image during the weekend drive. Even though they looked promising from a few meters away, this morning's workspace images showed us that the red Jura rocks we had hoped to drill are too fractured to drill safely. Sol 2250-2251: Grey today, red tomorrow! On sol 2250 Curiosity finishes the observations on and around the Highfield drill hole and drives on to an area where red Jura is exposed. InSight's successful landing is surely the biggest news of the week. But Curiosity was busy too! This week, and more specifically in this plan, we wrapped up the Highfield drill site campaign. Curiosity woke up to Mr Rogers "Please would you be my neighbour" this morning to welcome InSight, and then got very busy at the Highfield drill site. Today Curiosity is preparing for the imminent arrival of a new visitor to Mars, just as many of us are preparing for the out-of-town visitors who'll be descending into our homes over the Thanksgiving holiday. Curiosity is planning a smorgasbord of science over the next few days as it awaits results from digesting the "Highfield" drill target material. It's the windy season on Mars, and Curiosity's activities this weekend include taking oodles of images at different times throughout the day to catch how the wind moves sand and dust around. It's SAM day for our Highfield drill target! Today we planned to deliver a sample of the ground up rock from our Highfield drill hole to the SAM instrument. Sols 2229-2230: Preparing for more SAMple! Following a successful weekend of science activities at the "Highfield" drill site, today we're planning Sols 2229-2230. As we enter this weekend thinking about football, raking leaves, and if you're like me, sleeping a bit more, Curiosity will be gearing up for three sols of hard work! Today was a good day on Mars. The science and engineering teams are making preparations to drill a patch of grey bedrock named "Highfield", which will be our latest attempt to characterize this unique rock unit on Vera Rubin Ridge. Sol 2223: Optimism for "Highfield"
On Sol 2222, Curiosity drove ~10 m towards the "Lake Orcadie" location, in the hopes that we would be able to drill the gray Jura member here. Sol 2222: Déjà vu - Return to Lake Orcadie! Our attempts to drill grey rock on the "Vera Rubin Ridge" (VRR) continue. Sols 2219-2221: Curiosity goes bump! Curiosity had a good Halloween because it had resumed contact science. Today, Curiosity will have a targeted science block, drive, and then have an untargeted science block. Today was an exciting day for me as a member of the APXS team and filling the role of payload uplink lead, as Sol 2217 marked a return to contact science activities after our anomaly on Sol 2172. Today was the first day of planning with the full science team since Curiosity had an anomaly on sol 2172. The focus of today's three-sol plan is environmental monitoring. Sols 2211-2212: Getting Back into the Science Swing of Things! As Curiosity continues on her journey up Mount Sharp (the mound in the centre of Gale crater), rocks we encounter contain evidence for changing environmental conditions. Sol 2204: Curiosity science is baaaack! Contrary to the "frightening" title, the Curiosity team is excited that science operations are starting to resume! As Curiosity continues to mend, I've been looking forward to our next drill sample of gray rock. Sometimes planetary geology is like forensics. We are presented with a crime scene: Something broke down the original igneous rock, and made all those clays, veins and hematite nodules. Sols 2175-2176: Tell Us More, We Want to Help! Last night we learned that our drill attempt on "Inverness" was not successful, reaching only 4 mm into the rock. Sols 2170-2171: Go for Drill at Inverness! Drilling begins tomorrow (sol 2170) on what will hopefully be our 18thsuccessful drill hole in Gale crater! Sols 2168-2169: Starting the drill campaign at "Inverness"
In the weekend plan Curiosity drove to an area that the team thought would be a good location for the next drill site on Vera Rubin Ridge. Sol 2165 - 2167: It always looks grayer on the other side! Curiosity's last plan didn't quite get our intrepid rover close enough to our next potential drill location in the gray bedrock that is visually distinct on this part of Vera Rubin Ridge. In our case, the Curiosity rover! The main focus of our 2-sol (sol - martian day) plan today is to bump (drive ~15 m) the rover into place for an attempt at drilling an interesting grey coloured patch of bedrock, identified from orbit within the Jura member of the Murray formation on the Vera Rubin Ridge, referred to as "Loch Eriboll." Curiosity's plan for the weekend is extra large - 4 sols and almost 3 gigabits of data! We planned 4 sols due to the Labor Day weekend, and the hefty data volume is courtesy of extra downlink from two special orbiters. Sols 2157-2158: I'll Take the Quela To Go, Please! Today in Gale Crater, Curiosity begins with a short (but sweet) science block that utilizes ChemCam, Mastcam, and Navcam to observe the Martian surface and atmosphere. We start off with a ChemCam LIBS raster of the target "Cairntoul," and then Mastcam mosaics of the same target, as well as "Monar Dam." Look closely, and you can see crescent shaped scratches from the brushes of the DRT on the pre-drilled surface of Stoer. Our second attempt at a dump was successful! The plan for Sol 2155 starts with a whole slew of Mastcam images to check out various components of the arm turret, plus a MAHLI observation of the dump pile. If all had gone according to plan over the weekend, we would see a nice pile of drill fines. Alas, a slight hiccup in the sample dump process meant that the "Stoer" sample was still in the drill and turret. The big question coming into today was whether to re-do the SAM analysis or not. With seventeen sampling holes and several test holes, you might imagine that Curiosity is creating a rather long and erratic golf course in Gale crater. After all, Alan Shepard shot a golf ball on the Moon. Sol 2148: Well I'll be DANed! Curiosity is probing the subsurface today with its Dynamic Albedo of Neutrons (DAN) instrument. Sol 2147: SAM EGA on the Stoer Sample! With the successful drilling of the Stoer target two weeks ago, Curiosity has been busy characterizing the surrounding terrain using its remote instrument package, performing contact science in the immediate vicinity to understand the composition and physical nature of the bedrock, and also performing power-intensive lab-quality analyses of the Stoer sample using its onboard analytical instruments. Unlike normal weekend plans for Curiosity that encompass three martian days, this plan only covers two. This "Soliday Sunday" isn't really a day off for the rover like it implies, but instead allows the planning schedule on Earth and Mars to get back in sync. The planning day began with an interesting result from the previous plan's ChemCam RMI analysis of a target that was referred to as "Pettegrove Point Foreign Object Debris" (PPFOD), and speculated to be a piece of spacecraft debris. In today's plan, Curiosity begins analysis of the long-awaited Pettegrove Point drill sample at the "Stoer" target, which was successfully collected last week. Sol 2138-2140: Success at Pettegrove Point! On our third attempt at drilling within the Pettegrove Point member on the Vera Rubin Ridge, we have success! Curiosity has successfully drilled, and generated a pile of drill tailings. After two sols of analyzing our intended drill site in the Pettegrove Point member, we began plans to drill the target "Stoer." Sol 2134-2135: Third time's a charm? After a weekend full of contact science, remote science, and driving, Curiosity arrived at her next drill site within the Pettegrove Point member. Our previous two drilling attempts within the Pettegrove Point member haven't been as successful as we'd have hoped; the rocks in this area are much harder than we're used to - all the more reason to acquire and analyze a drill sample. We're hopeful that our third drilling attempt does the trick! Curiosity is currently preparing to bump to her next drill site in the Pettegrove Point member, but not before gathering many observations at our current location. Sol 2129: Dude, where's my data? Curiosity is currently on her way to a potentially softer rock target to drill in the Pettegrove Point member of Vera Rubin Ridge. Today was a late slide sol, which means we had to wait until 11am PDT for the downlink to arrive. Unfortunately, we didn't get our downlink today from MRO. On Sol 2128, Curiosity will continue toward our third potential drill site within the Pettegrove Point member of Vera Rubin Ridge, where we are hoping to find slightly softer rocks. The day will begin with ChemCam observations of the target "Slioch," which was already analyzed by APXS, as well as the layered rock "Craignure Bay." Curiosity completed its drive successfully after the science team regrouped from the incomplete drill, which required a different than anticipated weekend plan. Our attempt at drilling the target "Ailsa Craig" was partly successful: the drill behaved exactly as it was supposed to, but unfortunately we weren't able to drill very deep. The rock here is just too hard! Since we didn't get a nice deep drill hole, the plan for the weekend is to do some final observations at this location and then move on another location to try again. Sols 2122-2123: Preparing to drill at "Ailsa Craig"
Yesterday, the science team chose a new drill target, "Ailsa Craig," and we spent the day triaging the target with our contact science instruments, DRT, MAHLI, and APXS. Mars dealt us a winning hand today, yielding a sufficiently flat parking space after yesterday's short bump to allow us to proceed with our plan to drill in this part of the "Vera Rubin Ridge." Our weekend drive completed successfully and we have our next intended drill target attempt in the rover workspace. Curiosity made great progress yesterday across the "Vera Rubin Ridge" toward the site of our next drilling attempt at "Sgurr of Eigg". In this weekend plan, we will collect more data about the ridge materials around us, and the sky above us, before embarking on a ~12 m drive to Sgurr of Eigg. The Sol 2115 wheel imaging went well, and we received the images needed to plan a drive back to "Sgurr of Eigg," near the Sol 1999 rover position. The priorities for Sol 2115 are to image the rover's wheels and acquire the images needed to plan a drive back to the Sol 1999 location, where we might start another drilling campaign. After our attempt to drill the Voyageurs target did not reach sufficient depth due to the impressive hardness of the rock, the team is beginning to finish up its activities at this location before heading a bit further uphill to find a more suitable (i.e., softer) drill target. Unfortunately, we found out this morning that the "Voyageurs" drill target was a much harder rock than expected. While our drill plan executed perfectly, our bit stopped short of the full depth we need for sampling. Sols 2110-2112: Let the drill fest begin! Drilling on another planet is no easy feat, and each time we have the opportunity to do so on Mars feels pretty special. I first became involved with Curiosity shortly after starting my third year of graduate school in the fall of 2011. My graduate advisor was selected to join the mission as a Participating Scientist, and he enlisted me to help analyze orbital data over Mt. Sharp as part of that role. After being out of commission for over a year, Curiosity's drill is making not just a comeback, but a strong one, with imminent plans for a second drill hole within the span of 60 sols. The image above shows the Mastcam view as of Sol 2104, in which the nearby terrain is clearly visible, but nothing beyond the foreground, and the entire scene looks a murky red-brown color due to the dust storm. Sol 2104-06: Have we reached the peak? Our primary goal for today's planning was to continue to approach our next drill location on the Vera Rubin Ridge. While the rest of us are enjoying fireworks, BBQs, and spending time with friends and family, Curiosity will remain hard at work over this Fourth of July holiday. Curiosity is back on top of the Vera Rubin Ridge once more, having completed our drive over the weekend as we move toward our next drilling target in the "Pettegrove Point" geological member. Curiosity stopped its drive a bit earlier than anticipated. It so happens that the autonomous software onboard Curiosity designed to keep it driving safely kicked in and ended the drive short of the planned distance. After a steep drive Sol 2094, Curiosity is back over the crest of Vera Rubin Ridge and enjoying the view of flatter terrain ahead. Today's 2-sol plan kicked off with the good news that our power state exceeded predictions, so we were able to add in some extra science activities. Despite the global dust storm (more correctly known as a "planet encircling dust event") darkening the skies, our nuclear-powered rover continues to do good science. Over the past week or so, Curiosity has experienced increasingly dusty conditions in Gale crater. Unlike her older cousin Opportunity on the other side of the planet, Curiosity is not solar powered and, therefore, doesn't suffer from the same power issues resulting from the darkening skies that Opportunity does. The dust storm that is challenging Opportunity closed in on Gale Crater over the weekend with a substantial increase in dust levels. Curiosity pulled away from the "Duluth" site yesterday, but given the blocky nature of the "Blunts Point" member and the sand in between those blocks, she did not get far. The last time Curiosity drove anywhere was 30 martian days ago. A lot has happened in these past 30 sols. The investigation of the Duluth drill hole is going well, and is expected to continue on Sol 2082. Sol 2081: "Just a Bunch of Dirt"
The final several sols of Curiosity's drill activities at "Duluth" are devoted mostly to imaging and to analysis of the pile of drill tailings that are dumped on the ground after the delivery to the instruments. On Earth we have multiple means of communication-cell phone, text messages, land line, e-mail, and good old snail mail. On Mars the rover basically has three-a UHF antenna that communicates with satellites orbiting Mars, a low-gain antenna (LGA) that does not need to be pointed but only handles a low data flow, and a high-gain antenna (HGA) that requires accurate knowledge of Earth's position to receive or send commands directly. Over the weekend, an error cropped up during a regular test of the high gain antenna actuators, leaving the antenna unavailable for uplink of today's plan, but otherwise healthy. Today we planned a weekend's worth of activities for Curiosity. For our weekend plan, we have two main priorities: perform another analysis with CheMin on our Duluth drill sample and continue our campaign of dust storm monitoring. Today, Sol 2075, was a fairly straightforward day of planning, as most of the plan will be devoted to carrying out a methane experiment with our SAM instrument to analyze an atmospheric sample. Today we received the happy news that the SAM instrument received enough sample to conduct its "evolved gas" analysis of the powdered rock from our "Duluth" drill hole! The focus of MSL operations continues to be on the analysis of the Duluth drill sample. We received confirmation that the "Duluth" drill sample was delivered to SAM this weekend, so we're ready to run our evolved gas analysis (EGA) tosol! Every single day that the Curiosity team gets to go into work and operate a one-ton rover on the surface of Mars is a good day. We're looking forward to analyzing some great drill samples from the "Duluth" rock target in Curiosity's Chemistry and Mineralogy instrument, CheMin. Sol 2067: 'Tis the Season to be Dusty. The previous plan included some tests of the sample delivery system, including delivery of a single portion to the closed cover of the SAM inlet. The imaging showed a small amount made it, but not as much as we'd hoped. Some of the Duluth drill sample was dropped into CheMin on Sol 2061, but not enough for a proper mineralogical analysis. So the top priority for today's plan is to again test the new drop-off procedure. After successfully drilling the "Duluth" target on Sol 2057 (as seen in the above Mastcam image), the science team is eager to find out what it's made of. As SOWG Chair today, it was exciting to plan the drop-off of material to CheMin and overnight CheMin analysis. Hopefully we'll get some good data about the mineralogy of this sample! This past weekend, Curiosity successfully drilled into the "Duluth" rock target, generating a beautiful pile of drill tailings! This weekend, Curiosity will attempt to sink the drill into the complexly-layered "Duluth" block. I was excited to learn earlier this week that my native city was chosen as the name of the latest drill site on Mars! The name was selected by geologists on the mission to recognize the Duluth Complex, one of the largest intrusions of gabbro on Earth, along the north shore of Lake Superior. Our sol 2054 plan was limited by a small morning downlink. Occasionally, the flight paths of the Mars orbiters over Gale Crater don't have favorable geometries for relays with Curiosity, and this means our data downlink passes are smaller than average. Today we received only 1.6 MB (Megabytes) of data at the start of our planning day. Sol 2053: Bump to "Duluth"
A successful drive on Sol 2052 brought Curiosity within bumping distance of what will likely be our next intended drill target. The science team named this target "Duluth." Duluth is a beautifully exposed Murray formation block visible in the Navcam image above. From our current location, we have a really nice vantage point of both the top and sides of the Duluth block. Analyzing blocks that have this kind of 3-D expression gives us a great opportunity to assess the full architecture of the rock. Rather than driving almost 11 meters, Curiosity only drove about 1/2 meter before stopping. So, we found ourselves looking at images of previous wheel tracks and contact science targets rather than a new location. Curiosity is currently investigating the Blunts Point member of the Murray formation, and searching for a suitable location to drill in the near future. Today is the third and final day that I'm serving as SOWG Chair this week at JPL, and I was happy to see that the bump we originally planned for Sol 2046 completed successfully on Sol 2047, placing the rover in a good position for contact science on a couple of bright blocks in front of the rover. In Curiosity-speak, a "bump" is a short drive the rover performs to better position itself for a particular science investigation (often contact science with the rover's arm). Yestersol's plan intended to include such a bump to reach a suitable target for contact science, but unfortunately the drive did not execute. As Curiosity continues to descend the Vera Rubin Ridge and back into the Murray formation, the science team is doing their best to characterize, for a second time, all of the structural, chemical, and spectral variations originally seen as we climbed up the ridge. The drive planned on sol 2045 will take Curiosity off of Vera Rubin Ridge and back into the broken-up rocks that comprise the Blunt's Point member of the Murray formation. Curiosity continued her journey off of the "Vera Rubin Ridge," driving west along the ridge flank toward a passable route down to the bedrock north of the ridge. Her stop today may have been brief, but it was ehhhhhhxcellent. Our drive from Sol 2039 was successful, and the plan for sol 2040 is to continue driving to the west. Sol 2039: All eyes on "Red Cliff"
Following some fantastic preliminary imaging from yestersol, today's plan (Sol 2039) is dedicated to additional imaging of "Red Cliff" before continuing to drive toward a location where we think we are likely to drill. We have a short science block to start the day, during which we'll use Mastcam to take some context imaging of our surroundings and upcoming terrain. A successful drive in the weekend plan set Curiosity up nicely for a full sol of contact and remote science. Curiosity continues to pick her way downhill off the "Vera Rubin Ridge" and onto the Murray formation rocks below. This weekend's plan only covers two sols, to give Earth planning time and Mars time a chance to realign so that the science team is not up in the middle of the night commanding the rover. Curiosity is continuing her march to the north and west, descending through the stratigraphic layers exposed in Vera Rubin Ridge and working her way back towards the unit known as the Blunts Point member, just below the ridge. Curiosity drove a little over 16 m to the west this weekend. The rover is currently skirting around the southern edge of a small, blocky impact crater on its way north off the Vera Rubin Ridge. This drive was remarkable because it marked a shift in Curiosity's strategic campaign: we have officially finished our initial reconnaissance of Vera Rubin Ridge, and we are beginning our journey down off the ridge, heading north into an area where we would like to test the rover's drill. This was a week of transition for Curiosity's environmental science team. The cloudy season on Mars has ended as we've seen a marked decrease in water ice cloud activity in our Navcam sky movies over the last several weeks and we're moving quickly into the dusty season on Mars. Over the weekend Curiosity completed a 13 meter drive from some interesting float rocks including some potential breccias to "Suilven Ripple", a sand ripple where it will characterize the grain sizes and ripple morphology. Today is a 2-sol plan with no drive. The Sol 2020 drive completed successfully, placing the vehicle in a good position for contact science on the Waternish conglomerate. The top science priority for this plan is to acquire all of the data needed to adequately characterize the rocks at the current location before driving away. For the past few sols Curiosity has been exploring a diverse assemblage of cobbles and boulders on Vera Rubin Ridge, trying to understand how this blocky deposit came to be, and what the variety of rock types can tell us about geologic processes in Gale crater. An eclectic mix of rock targets has kept our team's attention for another sol today. Like Harry Potter in Honeydukes or Charlie in the Chocolate Factory, Curiosity rolled up to the proverbial candy store today, wondering "where to begin?!" The variety of rock types in the workspace, the likes of which had not been seen for many hundreds of sols, made picking favorites a challenge. For much of the last year, Curiosity has been exploring fine-grained rocks along Vera Rubin Ridge, and investigating red and gray color variations. Recently, something else caught our eye: dark cobbles and boulders exposed in patches, as seen in the above Mastcam image. After a 38 meter drive Curiosity reached the location that the team has called Region 13 of Vera Rubin Ridge. After failing to pass SRAP (the process that makes sure the rover is safe to use its arm) on the previous sol, we finished up the set of observations possible at this location. After the weekend drive, the rover ended up in a spot that was a little too unstable to pass the Slip Risk Assessment Process (SRAP). That means that there is a slight chance that the rover's footing might shift if the robotic arm is extended, which is not ideal for the safety of our contact science instruments, so for the Sol 2011 plan we chose not to use the arm and instead focused on remote sensing. Yesterday Curiosity drove 35 m to the southeast, which set us up for some great contact science on the rim of a small impact crater. Sol 2007: "Today is a Shetland Day!" The science team today had a few tough decisions to make to balance time and power. Sol 2006: Three (Martian) Years on the Surface! As of ~9:00pm Pacific Daylight Time this evening, Curiosity will have made three revolutions around the Sun while exploring Gale crater. After completing a nearly 55m drive, Curiosity found itself sitting right in the middle of the strongest spectral detection of hematite identified along its path up Mt. Sharp. For Sol 2004, Curiosity threw it back to the 2004's sleeper hit Mean Girls when the rover said, "Stop trying to make 'drive' happen." The weekend drive stopped after just a few meters due to a high current warning from the right middle wheel. Curiosity is currently sitting in front of a steep outcrop that shows some interesting geologic relationships between rocks in the Vera Rubin Ridge. Today marks a milestone for Curiosity. Our trusty Martian rover has spent 2000 sols exploring Gale Crater helping to unravel the geologic history preserved in the rocks. Curiosity is but 1 sol away from a major mission milestone, but work always comes before celebrations. Today was a fairly quiet day of planning on Mars, the reason being that most of the MSL science team is currently attending the Lunar and Planetary Science Conference (LPSC) in Houston, Texas. As we drive east across the top of "Vera Rubin Ridge" - backwards no less! - we encountered another nice patch of bedrock in Curiosity's workspace today, motivating multiple observations before we hit the road once again. After a successful weekend plan, the team decided that for the sol 1991-1992 plan, we would trade a longer-distance drive in favor of some "touch and go" contact science. This ensures that we have a good record of the variations in chemistry and rock texture as we drive along the Vera Rubin Ridge. We found out this morning that in the Sol 1986 plan, ChemCam was marked as "sick" and did not run its sequences. Seasons make a big difference for Mars vistas. Tosol Mars is at solar longitude 139, meaning that it is halfway between winter solstice and spring equinox in the southern hemisphere where Curiosity resides. Sol 1985: How Hard is a Rock? Last week when the first Vera Rubin Ridge drill-hole attempts turned out to be too shallow at "Lake Orcadie", discussion in the team turned to the question of, "How hard is that rock? Vera Rubin Ridge is as hard as a rock! After two drilling attempts, Curiosity's drill was not able to dig into the bedrock sufficiently to collect a sample of rock at this location. All of the data returned for the second drill target, called "Lake Orcadie 2," support the decision to attempt to acquire sample at that location using feed-extended drilling. Today, Sol 1980, we're taking a break from drilling activities to continue with our remote science campaign at our current location. We have three science blocks in today's plan, which we've filled to the brim with a variety of observations. It is an exciting time for the Curiosity team. 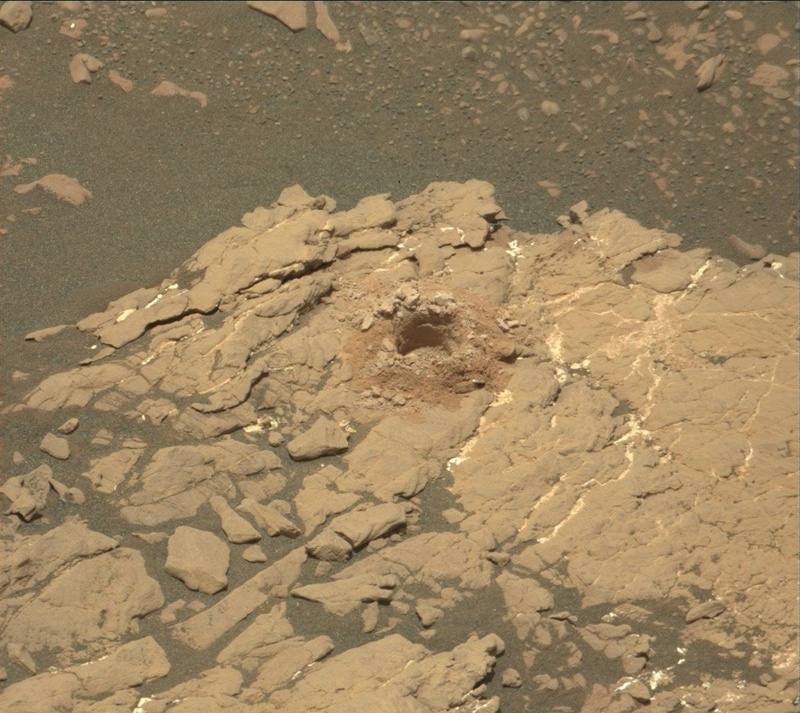 Although the drill was able to create a hole, Mars stubbornly refused to let the drill reach a depth where a rock sample could be collected and has driven Curiosity away from "Lake_Orcadie". The tactical planning schedule was delayed by 2 hours today so that we would have the latest data from Sol 1977 available for planning. When the data arrived, it quickly became clear that the feed-extended drilling did not complete as planned. After a successful drill preload test, Curiosity was primed to drill for the first time in about a year. Curiosity has returned to its primary mission of drilling rocks on Mars in an attempt to rescue critical science on the Vera Rubin Ridge from the clutches of vile mechanical failures. Sol 1973: Go for Drilling! Curiosity is officially go for drilling the "Lake Orcadie" target! After more than a year's wait for the drill to come back online, the rover planners and engineers are confident and ready to proceed with a test of a new drilling method in the coming days. Tosol we planned to finish up our suite of observations on the "Ogunquit Beach" sand sample that was off-loaded from the rover over the weekend. Over the weekend, Curiosity successfully off-loaded the sample she acquired previously, the "Ogunquit Beach" sand sample, in preparation for what the science team hopes is acquisition of a new *drilled* rock sample very soon. The DRT brushing of the potential drill target completed successfully, as did SAM's recent analysis of the Ogunquit Beach sample, and the rover is healthy and ready for more! We are planning 2 sols today to get a head start on the holiday weekend planning. We had several options today, including mobility and contact science with or without brushing, which made for an interesting day for me as SOWG Chair. For the last several months, the science, engineering and operations teams have only met three days a week to plan activities for Curiosity in order to give the engineers more time to focus on bringing the drill back online. Like yesterday, today's plan is a bit on the thin side, as the rover's power allotment will be primarily dedicated to activities associated with the Sample Analysis at Mars (SAM) and its preparation for a planned power-hungry experiment in tomorrow's plan. Over the weekend Curiosity drove ~52 m to the northeast to another patch of gray bedrock. The team is interested in characterizing the gray bedrock to determine if we might want to drill here. Today we planned for a weekend of activities at the same location we've been at all week. Recovering from the SAM fault proved more challenging than expected, so our planned drive to the patch of pale tan bedrock in the image above did not take place. We took advantage of the fact that we have been parked at this same site for several sols to acquire both new and less-common types of observations. Over the past several months we've made excellent progress up and along the Vera Rubin Ridge (VRR), taking stunning mosaics and using our instrument payload to examine the local geology. Today we planned for Sols 1957-1958, during which we will continue our VRR investigations and drive further along to our next area of interest. Unfortunately, SAM experienced a minor fault over the weekend, so we'll be delaying those activities - a preconditioning test for an upcoming geochronology experiment - to Wednesday's (Sol 1959) plan. Every February 2nd the people of the United States and Canada observe a quirky holiday called Groundhog Day. Sols 1952-1953: Another "touch and go"
Along with many of my MSL colleagues, I'm attending our semi-annual science team meeting, enjoying the presentations and discussion of recent results and plans for the future. Going in to planning today, there was a concern that we would run up against constraints on power and complexity that might force us to eliminate some of the science we wanted to do. Curiosity diverted from our primary "Mount Sharp Ascent Route" a couple weeks ago as we continued to investigate the outcrops of bluish-toned rock that are scattered around this region of the Vera Rubin Ridge. Having spent 1943 sols on the surface of Mars, Curiosity is in its 6th Earth year on Mars, but it is in its 3rd Mars year of exploration. That means Curiosity has encountered this season of the year twice before. We're sorry, but we will not be posting updates to this blog during the government shutdown. Also, all public NASA activities and events are cancelled or postponed until further notice. We'll be back as soon as possible! Sorry for the inconvenience. The Sol 1939 drive went well, placing MSL next to the bright/dark transition seen at the right side of this image. Today's two-sol plan will wrap up activities at Vera Rubin Ridge location "e." When we assessed the downlink data this morning, we were excited to see that ChemCam did a great job with some very precise pointing in the previous plan. At location "e" we have been focused on understanding small-scale features, like the tiny crystals and veins seen in the above ChemCam RMI image. Today we're continuing our science activities at the Vera Rubin Ridge (VRR) location "e." It certainly seems that "e" should stand for "exciting," as we've collected quite a rich set of observations at this location, including extensive imaging and geochemical analyses. What's in a name? From its rather innocuous sounding informal site name, you might not guess that location "e" would generate such excitement in the science team. The first thing the science team on shift did was decide to stay at the current location rather than drive away. This was primarily driven by the large suite of excellent science targets available in the workspace. These targets continue to help constrain the geologic story of the Vera Rubin Ridge. Curiosity has made it to "Region e" of the Vera Rubin Ridge (VRR) campaign. This location is a slight depression with exposed fractured bedrock that appears more "blue" from orbit than the surrounding region. In addition, the orbital evidence and observations from the ground suggest that this location is similar to "Region 10" that we visited just last week. For the last several weeks, Curiosity has been hopping between areas of blue-ish toned rocks on the Vera Rubin Ridge and the results from these locations continue to become more compelling. Sols 1927-1928: Layers of fun! Today's image is a color version of part of the workspace image from the Sol 1925-1926 blog, which shows in greater detail the numerous layers and color variations that kept us at this spot for another round of science observations. There's no real rest for the rover. We planned sols 1921-1924 on December 22 and 29. Earlier, the team had planned a minimal set of activities for the rover to carry out over Sols 1913-1920, letting the science and engineering teams spend a bit of time away from work.